For many, the Downtown Food Pantry at Westminster Presbyterian Church is a valuable resource. Here is the story of one of many they have helped. For Scott Smith, 52, the Downtown Food Pantry at Westminster Presbyterian Church provides more than just food. It enhances his quality of life. He first found the pantry when he was at one of his lowest points. Today, he’s able to help those who, like him, are in need of a good meal and a friendly face. The trouble started about 15 years ago, when Scott was working as an office manager for a waterproofing company in Grand Rapids. The holidays were coming up, and he was standing on a ladder hanging Christmas decorations. He fell off the ladder and injured his back. Scott soon learned that the accident had permanently damaged his spine. He couldn’t walk. It wasn’t long before Scott lost his home. Westminster was there for him when he needed it. 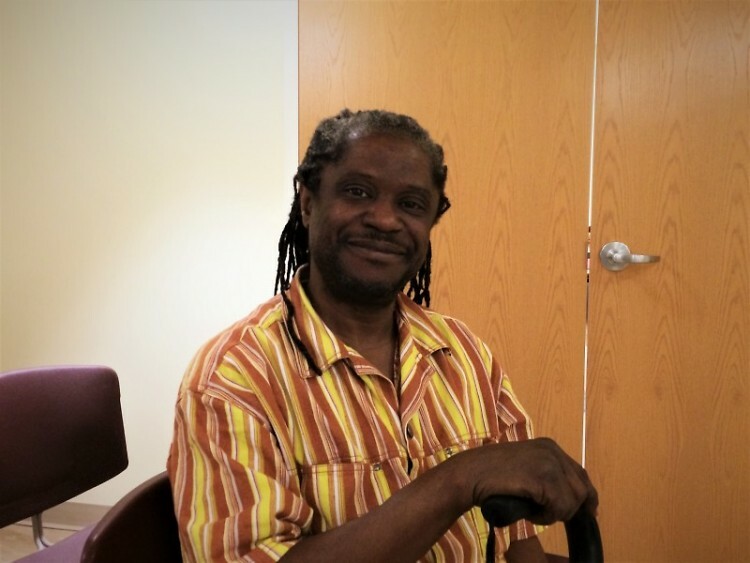 Being one of Feeding America West Michigan’s partner agencies, they fed him when he had no food and was living on the street. One volunteer even gave him clothing when he had none. They’ve been there for him since 2002, and he’s overjoyed to be able to give back as a volunteer. The pantry is open every Tuesday and Thursday and is staffed largely by volunteers. Often, clients themselves will volunteer. Lots of elderly and disabled people help as well. It’s work that fits their physical restrictions, like it does for Scott. Westminster is located in downtown Grand Rapids and has “a really small geographical area but we have one of the bigger pantries because of our population,” said the food pantry director, Angie Kelley. In Westminster’s Census tract, 37.3 percent of residents are food insecure, 1 in 5 is unemployed, and the poverty rate is pushing 50 percent. On an average about 100-150 households come through the pantry each week. Each client can come once a month and can choose one month out of the year to come a second time as a supplement if they are in dire need. Westminster also refers clients to the Community Food Club of Greater Grand Rapids, a low-cost, membership-based grocery store. “The average household income is between zero and $700 a month,” Angie said. Clients go through a short process before they receive their food. They register at the front desk, have a short interview, and then choose their foods from a list on a large whiteboard. They can take up to three personal care items, 11 items of fresh produce, and three sides. “Most of our food comes from Feeding America [West Michigan],” Angie explained. For Scott, the community at Westminster, the feeling of belonging and the purpose he finds in volunteering, have been just as important as the food he received in the beginning. Thanks to Section 8 housing and ongoing support from Westminster, Scott’s basic needs are largely met, but life is still difficult. He does not yet receive Social Security benefits and continues to struggle with depression, anxiety and physical pain, the lingering effects of the traumas he endured. He frequently has “level ten” pain, but hides it well. “Because people can’t see the illness,” he said, they assume he’s fine. He has to explain to people regularly that he just physically can’t do most things anymore. Getting out of the house to volunteer and “seeing other people in need, or someone worse off than you,” he said, “touched my heart.” Choosing to volunteer was a simple decision for him. The fact that he can relate to many of the people he serves makes him that much more effective in his role. Scott is just one of thousands of volunteers in Feeding America West Michigan’s network, working with agencies like Westminster to make sure their neighbors have enough to eat — and doing a little bit to restore their sense of community and belonging in the process.